Voters will have a chance to weigh in on a proposed Spokane stadium after all, as the city council has approved an advisory vote on the facility’s location. There have been questions of late about the proposed stadium. A downtown stadium proposal had been touted by Spokane mayor David Condon, with the plan calling for a 5,000-seat facility to be constructed near Spokane Arena. 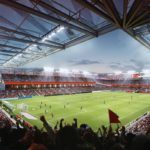 The facility would be designed to host professional soccer, high school football, and other events while serving as a replacement for the existing Joe Albi Stadium in northwest Spokane. In a special meeting that lasted less than an hour, the council voted 5-1 to place an advisory vote on the Nov. 6 ballot on whether the Spokane Public Schools’ proposed stadium should be located at the current Albi Stadium site in northwest Spokane or on Public Facilities District land in the downtown area north of the Spokane River. The vote is not binding on the school district. The move comes a week after the council tabled an extra $10 million for a parking garage and $21 million to improve the Merkel Complex to the original $77 million city bond measure for libraries…. As part of the Spokane Public Schools’ $495.3 million bond measure, the district would build the new stadium at a total cost of $31 million. That cost would be the same whether the 5,000-seat structure is built in northwest Spokane or next to the Spokane Arena. 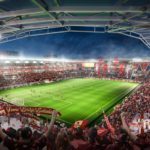 The downtown stadium concept has drawn the intrigue of deepRoot Sports & Entertainment–an entity led by Howard Cornfield, a former general manager of the bygone San Antonio Scorpions (NASL)–which has shown an interest in placing a professional soccer club there. Image of USL action courtesy Toronto II FC.